This description for Him referencing Ephesus is Him that holdeth the seven angels of the seven church and who walk in the midst of the seven churches. Ephesus The city of Ephesus during this time was a major city with a lot of economic activities going on. Ephesus is located in the western Asia Minor at the mouth of Cayster River (what is now the modern-day Turkey) providing for the possibilities of a lot of trading at the port. During Paul’s time, the city is estimated to have been one of the few for being the largest cities in the world. The church of Ephesus was one that Paul helped to get started which can be read in Acts chapter 18. During the Roman period, this city also got its popularity due to having the Temple of Artemis (or Diana). 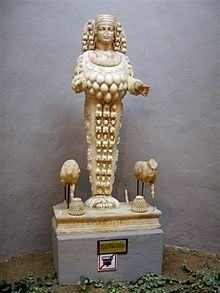 Other economic benefits were achieved by selling small idols of Artemis. This was probably this biggest area of a “challenge” for the new church which Paul started. Looking Closer at Artemis, or Diana, is sometimes described as her being the twin sister of Apollo (note that Apollo is another name of Nimrod).This mythological goddess was declared the goddess of hunting, wild animals, wilderness, childbirth, virginity and protector of young girls, and bringing/relieving diseases for women. For Ephesus, Artemis was called the Lady of Ephesus and her worship/praise was sometimes done so to attack against Paul’s preaching. Below you will see the depicted idol they created for this goddess covered in animals and obviously being covered numerously with breasts for fertility. The Church of Ephesus In verse two it starts out that the church is addressed of where Jesus knows their works, their labor, and their patience. The verse then goes on to where He acknowledges how the church could not stand individuals who were evil and how they even brought out and tried apostles to find them liars. Verse three goes on in mentioning the good works of what the church of Ephesus has done. The first phrase in verse three may be a little confusing at first but can be cleared up fairly quick. The word “borne” and “born” are of two different meanings. According to the dictionary borne is defined as carried by or spread by unlike born which means to bring into existence. Borne is a past participle of the word “bear” but let us look at the Greek definition of this word as well. In Greek, “hast borne” is the word βασταζω (bastazo pronounced bas-tad’-zo) which also means bear, carry, take up, and/or take up with hands. This phrase is talking about how that the church spread the gospel word by taking it up, carrying it within their hearts, and spreading it around by preaching. The next two phrases show that they worked hard for the glory of Jesus Christ and had the patience of doing so while not fainting or, in other words, not growing weak in the process. The Loss of Their First Love Even though the church of Ephesus started out well, we see in verse four that God was partially against them for, as it is said, they left their first love. All of their works that was mentioned in the previous verses were great but the church had fallen out of their way with Christ and started to let man lead the way more so than God. Just because they had done good works in their past did not mean they could be allowed to do as they pleased in the future. If the idea of being “once saved, always saved” were actually true God would not have been against them and would have not needed them to repent but we can clearly see in verse five our merciful God allowed them another chance and asked that they would repent of their falling away and go back to their first actions. This allowance of asking them to repent did not go unwarned, if they failed to heed the call their candlestick would be removed out of its place. Remember that the candlestick represents a church so this was in reference of God warning the church of Ephesus to repent and if they did not the church would be removed/destroyed. The Nicolaitans Granted, God was against their “backsliding” He did still find one favor with them of where they hated the deeds of the Nicolaitans. Before going in farther, do not take it out of context that the church of Ephesus or God hated the Nicolaitans but only that they hated their deeds (actions). The Nicolaitans are claimed to be followers of a Nicolas mentioned in Acts 6:5 one who was a proselyte of Antioch. This claim is only an assumption but what seems to be an agreed upon detail is the deeds of the Nicolaitans being that they participated in fornication/adultery, they would eat food sacrificed unto idols, and they believed they could live guilt-free in sin. We should all agree that these actions would be actions that God would indeed hate. The Tree of Life In the last scripture associated with the message to the church of Ephesus we find a gift that was offered unto those who repented. The first part of this verse states to those who have an ear let them hear what the Spirit has to say. This can be looked at as the Spirit trying to talk to their conscience and be convicted for what they are doing wrong. The gift that was offered unto them was that of eating from the tree of life. The tree of life was first found in Genesis as one of the trees that was present in the garden during that time. Let us look at some verses about this. Looking at this one verse we can see that two trees were in the midst of the garden; the tree of life and the tree of knowledge of good and evil. We know that it was forbidden to eat from the tree of knowledge however nothing was said against the tree of life. First take note that two trees were in the midst of the garden. Second, take note that when Eve was taking to the serpent that she only stated that Adam and her were not to eat of one tree in the midst of the garden. Verse five makes it clear that the tree of knowledge is being talked about. However, my point is not related to the tree of knowledge but of the tree of life. From day one of life with Adam and Eve, God offered humanity the choice of eternal life and loving humanity so much to allow us to have the freedom to choose so. What exactly were the choices that they had? Here are the choices which I believe were present before Eve touched the tree of knowledge. I will not go into different scenarios of what exactly could have happened to remain simple and keep on subject. Eat of the tree of life and have eternal life. Simply touch the tree of knowledge and die. Just for understanding, the fourth choice is only speculation and is not mentioned biblically. I do not intend to try, nor claim to alter the state of God’s Word. Upon the choices of what we do know to be certain, though, God was there already trying to offer us His gift of eternal life with Him and keeps offering that same gift throughout life; even to the church of Ephesus. The last verse goes on to say that the tree of life is located in the midst of the paradise of God. From this part of the verse and from the verse in Genesis chapter 2, it seems that the garden of Eden was made to resemble the paradise of God or that the paradise of God was made to resemble the garden Eden. Either way, there is a resemblance and the point is that God is constantly offering unto all mankind the gift of eternal life. The Description of Jesus for Smyrna Unlike the description of Ephesus, here we have a different description of Him being the first and the last who was dead and now is alive. This phrase is so powerful and has so much meaning behind it. Being the first and last, at the same time, obliterates all concepts of time. This is just so hard and seems impossible to comprehend to the human mind but at the same time it shows just how truly magnificent our God is. Nothing is too great or too small for Him. Next, we have another awesome description of Him being dead but now is eternally alive! We should already know that having life is a miracle in itself but now take that and turn to life being brought from death. Without this, we would never have our own chance of receiving life from death. Just to make it clear how much more powerful this is, He died and brought Himself back to life! So awesome! 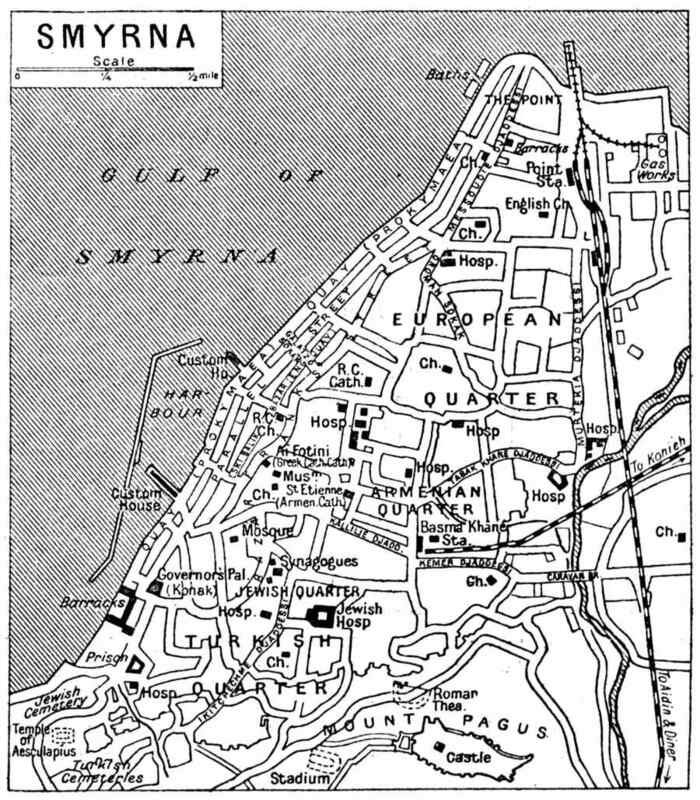 Smyrna In John’s time, Smyrna was a port on the western coast of Asia Minor where the Hermus River flowed in. This was at the tip of the gulf and also consisted of a very protected harbor and a natural inland trade route that followed the Hermus Valley. In 627 B.C. the city was destroyed by Lydians and not much was rebuilt of the city until after 4 B.C rising back up into power. Around the time of 26 A.D. the city constructed the second Asian temple unto Caesar. This powerful city was known for its science, medicine, and astounding structures. The Church of Smyrna The message to the church of Smyrna starts off by the statement of understanding that God knew of their works and that He also knew about the trials that they had to struggle through, as many Christians do experience. Third, it is stated that they were poor but rich. Even though the worldly money was not much to be had, the church was rich with God’s mercy, love, and grace. Being a servant of God is so much more of a blessing than just being wealthy of the worldly treasures. This verse goes to point out that a rich man parting away from his wealth is a challenge upon the rich man for many do not want to lose their worldly treasures. The eye of the needle is assumed to represent a gateway or passage way of some kind in which camels would have to be completely unloaded and made to kneel in order to pass through. The fourth aspect that God mentioned to them of His understanding was those were blasphemous for pretending to be Jews and actually weren’t. The word blasphemy is defined to describe great disrespect towards God or anything of a holy value in reference with God. Moving on to verse ten, God brings out encouragement to not fall into fear of the things to come to pass. Next, God foretells of future persecutions to come to pass which even includes some being cast into prison and tried. Not everyone will experience prison as a persecution, however they are told their tribulations will last ten days. The key of this, is to understand that even though persecution and tribulations arise, they will not last forever but only a short season. Looking Closer Digging deeper, there could be some kind of added meaning for the number of days (10) that tribulation would last. Whether this has any significance or not, it is interesting to also note this is stated in the tenth verse of this chapter. The number ten has a lot of interesting connections. For symbolism the number represents the Trinity (3) and creation/completion (7), where 3 + 7 = 10. Another powerful symbolism with this is that the number ten is regarded as the perfect number since it contains the beginning unit (1) which started everything and then zero; the beginning and the end. Also directly in biblical connection, among others, is the most obvious of the Ten Commandments which established law. Once again, the last verse related to the church of Smyrna contains a promise/reward for if they hear what the Spirit has to say to the churches, not just one church. Their reward for overcoming the obstacle of tribulations would be not being hurt of the second death. The Greek word here for death is thanatos which is defined as a separation of the of the soul and the body when physical life is lost while a future misery in hell. Those who do not falter in the trials of tribulation will avoid the second death and eternal punishment of hell. God’s word is a very powerful weapon designed to be able to accurately penetrate down to the depths of the soul. Pergamos was a city of the Mysia Minor located in the Asia Minor. The city was the seat for dynasties of the Attalus and the Eumenes.The Attalid dynasty came around after the death of a general for Alexander the Great, Lysimachus. The general had form a empire named after himself know as the Lysimachian empire. A fellow officer, Philetaerus, took control in 282 BC. The descendants from his father was the ones who formed the Attalid dynasty. The first ruler being Attalus then soon following was Eumenes while more descendants had the same names of these two. Also, it was well known for the Aesculapius temple and where parchment was invented and produced. The temple was dedicated on the isle of Tiber in 291 B.C. After a plague in 293 B.C. ambassadors where sent away to retrieve the image of the god which would be placed in the temple. When they returned, they did not have an image but had an actually serpent. When they arrived in Rome, the serpent abandoned the ship and swam towards the island. The Romans took this as a good sign. Artwork to portray inside the temple. Notice the serpent around the staff; common symbol in medical fields. 13. I know thy works, and where thou dwellest, even where Satan’s seat is: and thou holdest fast my name, and hast not denied my faith, even in those days wherein Antipas was my faithful martyr, who was slain among you, where Satan dwelleth. The next mentions of their positive actions He mentions that the church has held towards His name and not denied His faith, even in the time of when Antipas was martyred for the sake of God. Not much information can be gathered for Antipas since the only reference of in in scripture is just this single verse. Outside of this, it is claimed that the Antipas of Revelation is the same as St. Antipas who was alive during the reign of Nero. St. Antipas was claimed to have died at the time when he refused to worship idols which in return he was thrown into a blazing idol in the image of a bull used for sacrifices. 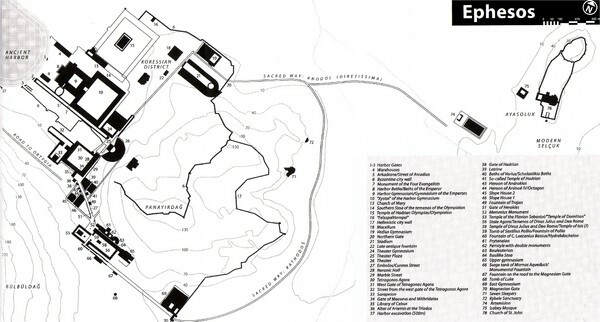 Once again, the location of where Satan dwells being possibly two-fold, referring to the temple and even Satan himself present at that location. Verse fourteen turns things around to where God brings out the wrongs of the church stating that the church had people inside who followed the doctrine of Balaam.